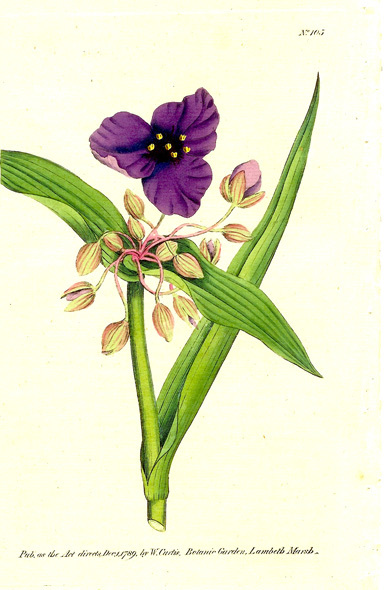 Glen Arbor Botanicals has an extensive collection of engravings from the London publication Botanical Magazine, or Flower Garden Displayed, established by William Curtis in 1787. In those days, plants were being brought to England from all around the world, and there was great public interest in botany and gardening. The plants were illustrated by engravings printed on hand woven rag paper, and then skillfully hand colored. Various artists worked for Curtis over the years and brought their individual styles to the work. Detailed text descriptions of the origins and cultivation of the plant accompanied the illustrations. Text pages are available for all of the Curtis plates.